This Lures image is watercolored on Canva-Paper - I love the texture of this paper, and it's great for all kinds of wet media. A good chunk of my release this time is dedicated to outdoor activities, and creating this fishing collection was really fun. My grandparents spent much of their time on the ocean, and the fisherman in this clear set (coming soon - preorder now!) is actually my grandfather. We just moved to the Truman Lake MO area, so I anticipate using these deer and fishing stamps quite a bit! This second card was quick and sample - the background is a sheet of cardstock that I cleaned my brayer on while gel printing. I sketched in the border by hand. Great masculine cards! I am always looking for these. Fabulous cards, always looking for masculine card ideas, and what great stamps to have to keep all the memeories of your grandfather! A new location means new inspirations! I love your cards. They are amazing! You make me want to do some DTP techniques just to get that great background paper! TFS! Dina, beautiful cards, beautiful new sets and how exciting to add your grandpa in one of them. Hope everything is well in your new location. Hugs! I love these! Especially the one with the lures. I agree it is hard to come by cards for men. Love the nature images! Great job. WOW Dina....great job on your new creations!!!! So usable for a guy card or just a beautiful backdrop for a scenic card!!!! Kudos to you gal! Great cards! Love the lures and your pretty coloring! Also, some fabulous scene stamps! They will be awesome for layering! The new layered "scene" stamps are amazing, as are your beautiful cards. I like the clean, jaunty colour scheme of the first with its popped-up images, and love the brayered background of your second card - perfect for the new fishing line stamps! It's so good to see a masculine card. Love it. I love the scenes. Love the background stamps! Well done. Soft colors and fishing stuff! Perfect to CASE for my daughter who fishes with a pink fishing rod! What great ideas for the fishermen in our lives! Beautiful work! Wow, I love the layering idea, so cool Dina, WOW!!! And both cards are awesome, I have never seen a stamp like the one on the first card and I love the colors you used. And the fishing lines together on the second card look awesome! Really amazing job! Thanks for sharing. What wonderful fishing and scenic images. Love the cards you made. My dad always took me fishing, along with all his children, grandchildren, and great grandchildren. These images bring back lots of memories for me, too. OH!!! I will need the be still stamp My husband passed away Monday and It is well with my soul was his favorite hymn. Thank you. Awesome cards I see myself making my brothers cards using these stamps. Wonderful cards & stamps! A must have for anyone who has fishermen, (or women! ), to make a handmade card for. I love these!! Super masculine cards. The layered stamps are very cool. Fabulous masculine cards!! I'm always on the look out for ideas for making masculine cards and these are awesome! 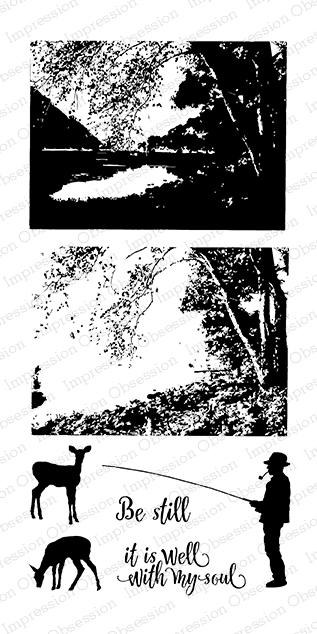 The deer stamps are wonderful, and the fishing lures remind me of my grandfather. Just a few Lines card is so clever! Love it. Great manly images and your cards are so fantastic. ooh what wonderful fishing cards!! I love the strings, I can see them being wonderful in many cards and the lures are soo cool! Your lures are amazing - such detail! And there you go with one of those clever backgrounds again! Thank you for sharing, Dina! OMGOSH!, that is quite a card! Love it! amazing, these cards are AMAZING. First one is such a great masculine card and the second, I just love the background! First those lures look like they would prick you they are so real!! Is it really your grandpa??? How fun!! LOVE the sentiments! Great creations - thank you for making them available to all of us. Love these outdoorsy stamps !!! Love your work. So fresh and original! awesome cards...my son is a huge fisherman and would love these cards....great job as always! !